Rabbit Pet: How To Pick The Right Pet Bunny Rabbit For You! Aside from appearance, there are a number of considerations that you will have to make when it comes time to pick out your fuzzy friend at a pet store or other venue. This is important both to ensure that you select a healthy pet, and to make sure that you and he are compatible! Now I'll explain what you'll need to think about prior to heading out to buy your pet rabbit, and what to look for when you're actually selecting an animal from a breeder, adoption center or pet store. Remember, while size, breed, fur type and color are mostly a matter of personal preference (as I've explained in the previous chapter), the considerations here are essential to bringing home and raising a healthy pet. There are a few general points to think about when deciding whether a rabbit is the right type of pet for you and for the rest of your family, too. Many people in this country have pet allergies, often to dogs or cats. 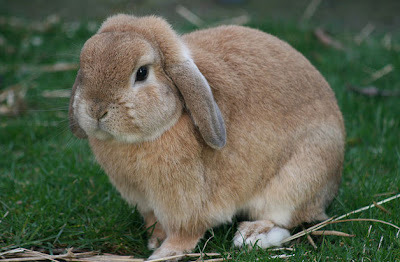 It is worth remembering that if you are allergic to cats, chances are you might well be allergic to rabbits. Of course, this is not always the case, and you may wish get an allergy test from your doctor before deciding to bring home a new pet. If you don't want to go to a doctor for a test, you may want to visit a pet store or breeder and see how you feel after handling the animals. Also keep in mind that it is not just the pet itself that you may be allergic to. Rabbits often consume hay, which could be problematic in households where a family member has hay allergies. Do you have young children? If so, a rabbit may not be an ideal pet. For the most part, this has nothing to do with rabbits being a danger to the child. On the contrary, since young rabbits are delicate and relatively tiny, a child may very well do unintentional damage to the pet! For this reason, older children, who have a better sense of their own strength and understand how to treat animals nicely, may be better suited to a pet rabbit. In any event, if you do choose to bring a pet rabbit into a home with young kids, always try to supervise interactions between your child and your pet to ensure that both remain safe and healthy. Children must be taught how to handle rabbits, and only if they are mature and responsible enough to be trusted with the fuzzy creature. Even if you adopt a rabbit for free rather than buying one, you should prepare for certain expenses. A good-sized cage will cost you at least $30 USD or $40 USD, and this is an absolute essential. You can also expect to pay for other accessories, such as toys. Feeding is another considerable expense. At minimum you will need to buy food pellets, hay and vegetables for your rabbit to consume. You may also need to supplement with vitamins. Then there is also the matter of the litter box and fresh litter, which can add up over time. Moreover, you will need to take care of medical issues such as spaying (starting at $35) or neutering (a bit cheaper, starting at $25), as well as medical bills for checkups and any illnesses that arise. Of course, it is also possible in some cases to purchase or adopt pet rabbits that have already been spayed or neutered, but even then it is going to be essential to pay for various medical expenditures over the course of your pet's lifetime. Before bringing home a rabbit, make sure that you can commit to giving him the quality of lifestyle he deserves throughout his lifetime (5-15 years, depending on the rabbit's breed and age and health at the time of purchase).